Pictures taken during the meeting are available here. For participants who attend the meeting with an accompanying person. There is a possibility for this person to participate to all social activities (welcome reception, excursion to the city of Bouillon, conference diner, including buses) for a cost of 100 euros. We need to know by May 20th how many accompanying persons are participating to these social activities. 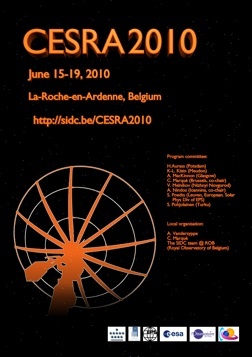 Send an email to cesra2010@oma.be, with subject 'Accompanying person', indicating the name(s) and number of accompanying person(s). PROBA2 SWT meeting: More information here. Registration to the meeting is now open and accesssible (see our registration page). The meeting starts in the morning of June 15th. You are invited to a welcome reception organized in the evening of June 14th. 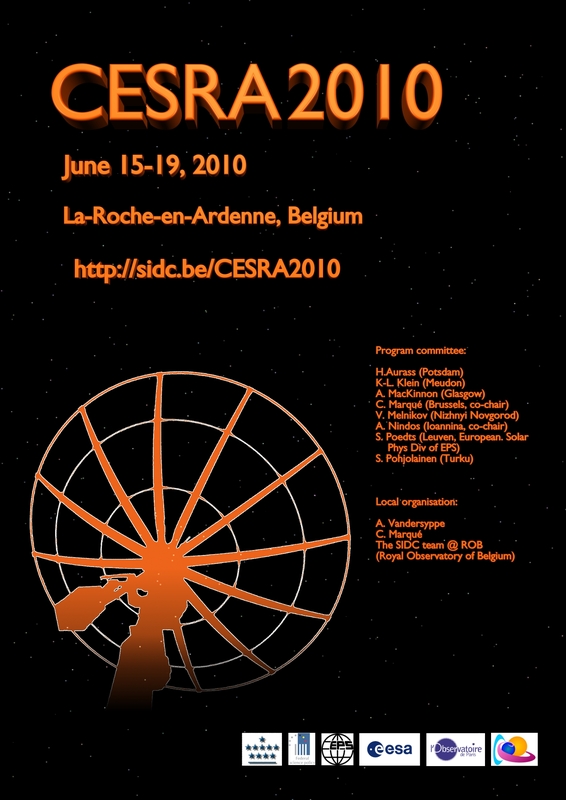 "Energy storage and release through the solar activity cycle - models meet radio observations"
Contact : Christophe Marqué (christophe.marque@oma.be). Scientific organising committee : H. Aurass (Potsdam), K.-L. Klein (Meudon), A. MacKinnon (Glasgow), C. Marqué (Brussels, co-chair), V. Melnikov (Nizhnyi Novgorod), A. Nindos (Ioannina, co-chair), S. Poedts (Leuven ; European Solar Phys Div of EPS), S. Pohjolainen (Turku). The workshop will address explosive energy conversion, large-scale instabilities and nonthermal processes in the active and less active solar atmosphere. The present unusually long decline of the solar cycle gives us new means to study coronal physics and its impact on the Heliosphere. Radio diagnostics contribute important information notably because they cover the whole range from the low solar atmosphere to 1 AU, and because of their sensitivity to non thermal electron populations. This will continue in the coming years, with new impetus from the space missions such as STEREO and SDO, projects for Solar Orbiter, new ground-based facilities, and the development of new databases and virtual observatories.